The day is almost here. The Annual Variety Show is this Friday! The Raffle will begin at 5:15 pm in the Atrium of Northwestern. Tickets may be purchased during this time while you eat and browse the Raffle items. All tickets must be entered by 6 pm. Winners will be drawn at the end of the Auction, before the Variety Show Performances begin. OR bring a donation for the Luther Seminary Food Pantry. The Auction will begin at 6pm, directly before the Variety Show performances begin. Students typically form small groups to bid on an experience together rather than individually, so it helps to plan ahead. Groups bid in the amount paid by the group as a whole, not per individual. Payment is not due the night of the auction, that can be settled in the following weeks at the Student Affairs Office. Variety Show – Last Chance to Sign Up! Seminary Relations will be hosting the Community Meal this week! We are excited to be recognizing one of our wonderful volunteers during the lunch, Luella “Lu” Zibell. Lu has been volunteering at Luther Seminary for at least 25 years and will be recognized by President Steinke at the start of lunch on Wednesday, April 10. Please join us in saying, “Thank you!” to one of our long-term supporters who blesses us with her time and energy every week, faithfully. We are so grateful for volunteers like Lu! Remember to sign up to give blood, and save a life that critically needs blood. Your generosity can change someone’s story. 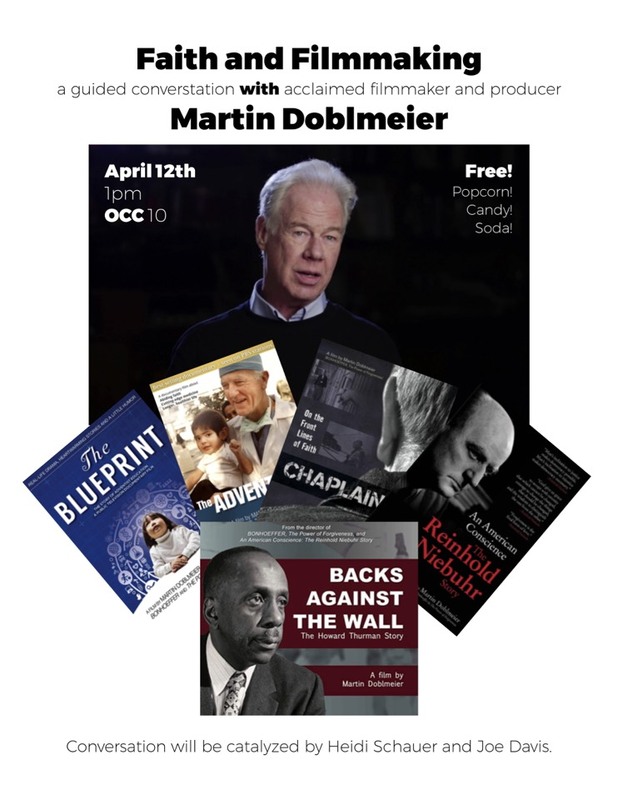 Join filmmaker and acclaimed producer Martin Doblmeier at Luther Seminary on April 12th at 1 pm in OCC10 for a discussion of “faith and filmmaking.” Our conversation will be catalyzed by two people engaged in creative art production, Joe Davis and Heidi Schauer. We will be providing popcorn, soda and movie snacks! * For Rolf Jacobson’s mother who is hospitalized and his sister-in-law, Cari, recovering from surgery. *For our sibling in Christ who is already struggling to balance family, school and work and is facing increased family demands for the next several months. *For our sibling in Christ whose life is constant and juggling an yearns to be held still in the presence of God.